Art, maps,imagery and graphs add context and a visual component to numbers, locations, and information. With as much influx of data we contend with on a daily basis, visualization tools allows our brains to take a rest while perceiving content in a different light. In essence, visualization allows us to stop and smell the pixels, in spite of the fact we might learn a few things along the way. Visualization is a technique to graphically represent sets of data that makes it easier to read and understand. Tools for visualization exist in search, social networks, online communities, mobile apps and desktop applications. Check out of some of the most unique visualization tools available today and don't forget to vote for your favorite in our Best Visualization Tools POLL at the end of the blog. Zensify is a new lifestreaming app for the iPhone that allows you to update, discover and keep track of what's important to you across a multiple networks. 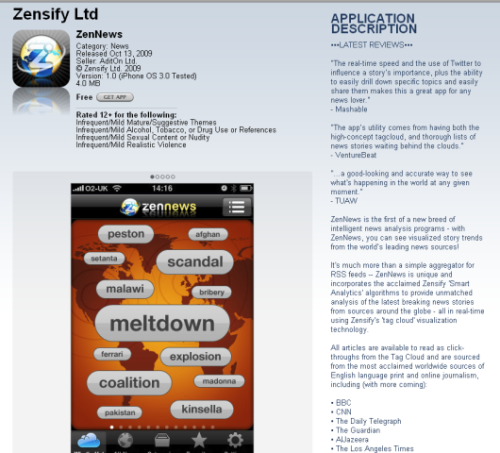 ZenNews is Zensify' news aggregator. 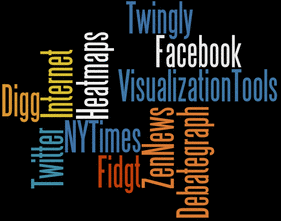 More than a simple collector of news for RSS feeds, Zensify's 'Smart Analytics' algorithm provides a cutting-edge analysis of the latest breaking news stories from sources in real-time using Zensify's "tag cloud" visualization technology. All articles are available to read as click-thrus and include some of most acclaimed news sources such as the The Guardian, AlJazeera, CNN, NY Times and dozens more. Heatmap sites like CrazyEgg tracks where visitors spend time on Web sites by utilizing software that creates a heatmap. 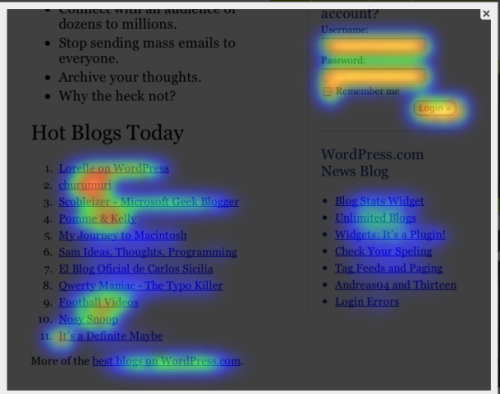 The heatmap captures users' clicks on each page and presents a visual summary from the "most clicked (red) to the less clicked (shades of blue). CrazyEgg offers free and paid services. With plans up to $99 per month, subscribers can obtain live reporting that shares what's happening in real-time on your Web site and where your clients and prospective customers might be spending the majority of their time. ClickHeat and Clickdensity are two other heatmap tools you might want to consider as well. Perhaps a little more abstract,The Opte Project has created a visual representation of space that is a described as a "one-dimensional, metaphysical universe" depiction. The data represented and collected here serves a multitude of purposes; including a modeling of the Internet, analyzing wasted IP space, IP space distribution, detecting the result of natural disasters, weather, war, and aesthetics and art (I did preface that this visualization tool is definitely more abstract than the others). Today the images have been used free of charge across the globe and is part of the permanent collection at The Museum of Modern Art (MoMA) and the Boston Museum of Science. It has been used in countless books, media and movies. Fidg't is a desktop application that allows you to view your social networks tagging habits. You can check out what kind of music your network is into, or what kind of photos they are sharing. Their 'Visualizer' tool shows how your network compares to a random sampling of the networks of other Fidg't users, letting you see how your network stacks up to others? To use Fidg't, you interface with the Visualizer through Flickr and LastFM tags, using any tag to create what they call a "Magnet." Once a Tag Magnet is created, members of the network will gravitate towards it if they have photos or music with that same Tag. Digg.com has some very unique web-based visualization tools that basically take all of the incoming Diggs entering the social bookmarking site and slices and dices those submissions in various ways. Digg's BigSpy positions stories at the top of the screen AS they are dugg. Consequently a popular story with the most Diggs will be seen at the top of the page, until newer and more popular stories take their place. Digg's Stack shows diggs in real-time, with diggs falling from the top of the screen. As stories get more Diggs, they appear in brighter colors. 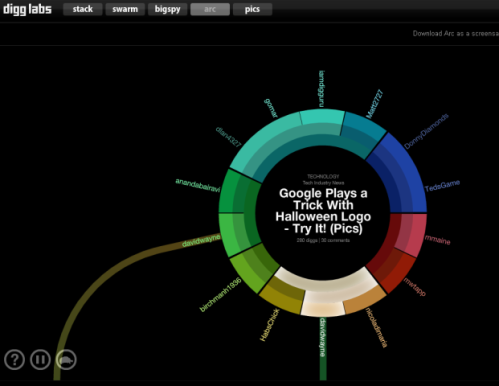 Digg's Swarm shows the stories surrounded by circles. With more popular entries, Diggers will swarm around stories allowing them to grow larger and appear brighter. Digg's Pics is one of the latest tools that tracks the activity of images on the site with a slider mechanism that slides images into view from the left to the right. Digg's Arc displays stories, topics and containers wrapped around a sphere, whereby the more Diggs, the greater the size of the arc. When you find the Twitterstream getting a little boring at times, consider some of the clever APIs that have been developed to entertain us by giving us a fun-way visual view of Twitterville. 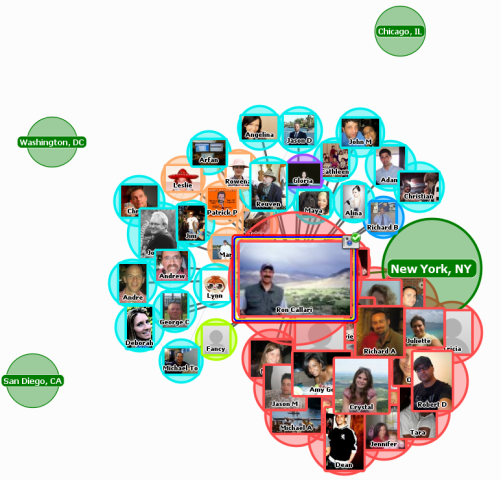 Twittervision is another geographic visualization of tweets coming in from all four points of the globe. It features both 2D and 3D visualization and integrates with Facebook. Users can publish their specific locations and statuses using this API. 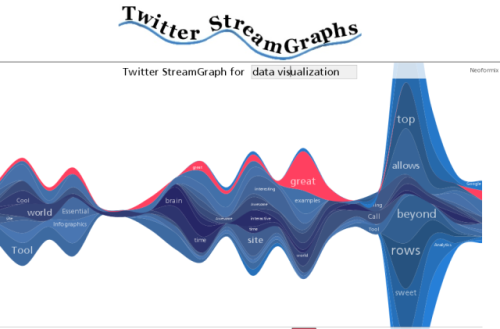 Twitter Stream Graphs tracks keywords and what is trending literally in the Twitterstream. Instead of loading bar charts or line items, it uses streams to display words and tags and can visualize the top keywords of any individual tweeter. Jeff Clark who developed this tool has also developed Twitter Spectrum and TwitArcs. This GoodMorning video is an overview of a Twitter visualization tool that shows about 11,000 "good morning" tweets from around the globe over a 24 hour period, between August 20th and 21st. 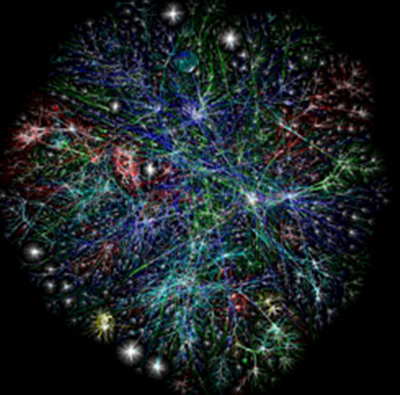 Visual representation of the Facebook network offer limitless possibilities. Some of these visualization come with tools allowing you to create some pretty nifty Facebook visualizations of your own. The New York Times features an actual "Visualization Lab" where you can create visu al representations of data and information using the "Many Eyes" technology by IBM Research. 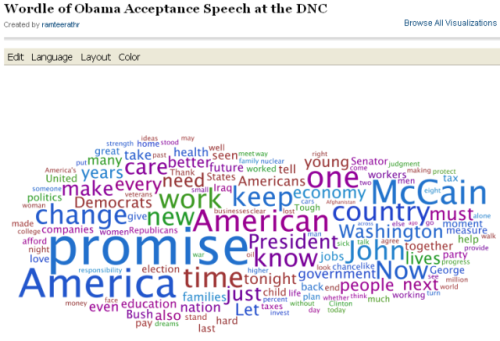 Here is a Wordle of Obama's acceptance speech at the Democratic National Convention. Note the larger words, where greater weight is given to words that are repeated. Worldles also have their own Web site and one can generate "wordles" for any topic they choose. (note: The TOP TEN graphic for this blog was developed in Wordle). 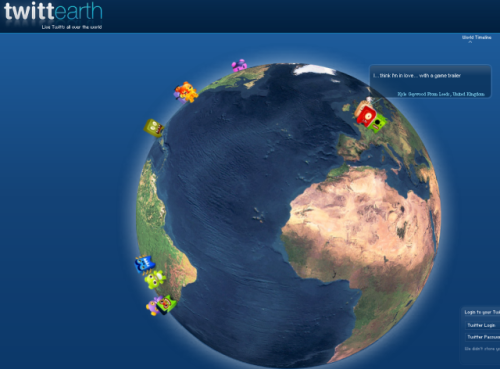 The global debate mapping found at Debategraph helps to define debates. Their goal is to make the best arguments on all sides of any public debate. Every debate map is provisional and open to iterative improvements by anyone who participates.This is must-have for debate teams and even some one at the level of our Secretary of State, Ms. Hillary Clinton. This particular map is working with Christina Amanpour at CNN to follow her TV newscast and the debates that surface weekly pertaining to the issues in these Middle Eastern countries. A short introduction to Debategraph.org; and how it helps groups explore, make sense of, and evaluate complex issues is shown in this video. 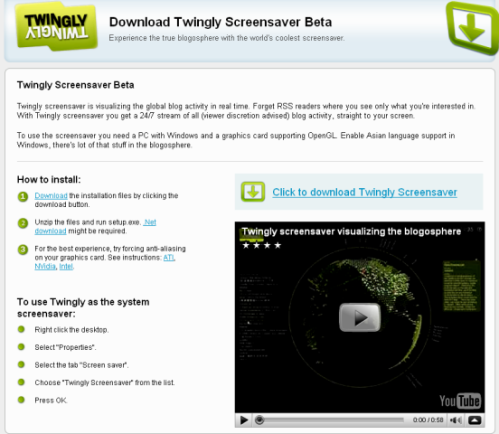 Twingly screensaver is visualizing the global blogosphere activity in real time. Similar to ZenNews (#1), you can forget RSS readers. With Twingly screensaver you get a 24/7 stream of all (viewer discretion advised) blog activity, straight to your screen. To use the screensaver you need a PC with Windows and a graphics card supporting OpenGL. If you enable Asian language support in Windows, you can expand your blog coverage to the Middle East. Without any marketing, Twingly.com currently serves 25M+ search results per month. Download instructions are found on this home page, complete with a YouTube instructional one-minute tutorial. Hope you enjoyed this list. There are absolutely 100s of other visualization tools you can research online. This TOP TEN grouping are my favorites. Vote for your favorite in our Best Visualization Tool POLL, and also let us know if we omitted one of the visualization tools you use in our comment section below. Plaid Looking To Collab With Inventors For New Craft Products! Thanks for this - very useful! In reference to the heatmaps section, i have just found a new tool that also offers real time videos of browsers sessions on your website. check out www.clicktale.com. Since social networks are all about being social, the visualizations on Twitter and Facebook are a unique opportunity to acknowledge your friends and followers to show your appreciation of them for being part and parcel of your social networks. It's also a means to communicate to others just how active you are in the social media space. Numbers are one thing, but what is it that we say about "one picture being worth a thousand words." 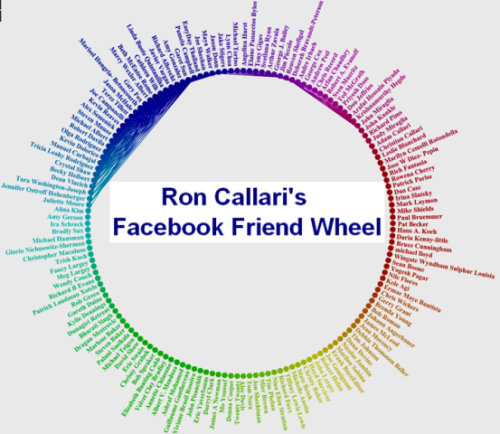 Ron Callari is a freelance journalist and editorial cartoonist. His slighlty off-center published work includes trends, social media, politics, travel, humor and political articles. Follow Ron on the InventorSpot and Twitter.